In New Jersey, real property can be transferred from one party to another by executing a quitclaim deed. Quitclaim deeds are identifiable by the word "release" in the granting clause, and they function to terminate whatever interest the grantor holds at the time of the transfer (N.J.S.A. 46:5-2). In New Jersey, conveyances in which the grantor remises, releases, or quitclaims interest in real property to the grantee without reservations "pass all the estate which the grantor could lawfully convey by deed of bargain and sale" (N.J.S.A. 46:5-3). This means that a quitclaim deed transfers the same quality of title as a bargain and sale deed. 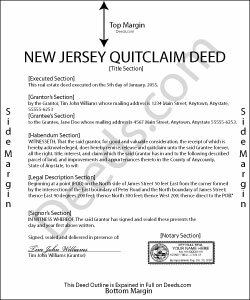 Quitclaim deeds differ from bargain and sale deeds, however, in that they do not include a promise from the grantor that he or she has not encumbered the property (N.J.S.A. 46:4-6). A lawful quitclaim deed includes the grantor's full name, mailing address, and marital status, and the grantee's full name, mailing address, marital status, and vesting. Vesting describes how the grantee holds title to the property. Generally, real property is owned in either sole ownership or in co-ownership. For New Jersey residential property, the primary methods for holding title are tenancy in common, joint tenancy, and tenancy by entirety. A conveyance to two or more unmarried persons is presumed to create a tenancy in common, unless otherwise stated. A conveyance to a married couple creates a tenancy by entirety, unless otherwise stated (N.J.S.A. 46:3-17, 46:3-17.3). As with any conveyance of realty, a quitclaim deed requires a complete legal description of the parcel. Recite the prior deed reference to maintain a clear chain of title, and detail any restrictions associated with the property. The deed should meet all state and local standards of form and content for recorded documents. Deeds transferring new construction as the term is defined in N.J.S.A. 46:15-5(1)(g) should contain the words "NEW CONSTRUCTION" in all caps on the first page (N.J.S.A. 46:15-6(2)(c)). If the conveyance is exempt from transfer taxes, explain why on the face of the deed. See N.J.S.A. 46:15-10 for transfer tax exemptions. Include a completed Affidavit of Consideration with deeds claiming exemption or partial exemption. Record a Gross Income Tax Form (GIT/REP) with a deed when transferring real property in New Jersey. Ask the local assessor or recording office for help in choosing the correct version of the GIT/REP. This article is provided for informational purposes only and is not a substitute for legal advice. Contact an attorney with questions about using quitclaim deeds, or for any other issues related to transfers of real property in New Jersey. Annette A. said: I requested a property report and it was completed fast and accurately. I would highly recommend this service. Patricia C. said: Only source I could find. Wasn't sure if I needed same certificate from each state and site had me checkout separately for each. Good way to keep you customer paying up. Just hope what I received is acceptable. Reply from Staff: Thanks for the feedback. Looks like your E-recording invoice is available. It takes a few minutes for our staff to prepare documents for recording and generate the invoice.